In the Middle Ages naval and military barbers were not only responsible for cutting hair (to remove lice), but also for surgery such as tooth-extraction, and amputations. In England it was not until 1745 that a surgeons' guild was created, separate from the barbers' guild. 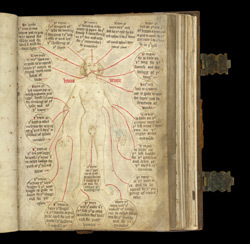 This manuscript was written for the guild of Barber Surgeons of York. Bloodletting was one of the most common 'cures' for illnesses in the Middle Ages, although it usually made the ailment worse, not better. This drawing of a naked man illustrates the veins which can be used for different treatments. For example, from behind his ribs a red line links to a roundel with a caption which reads: 'The vein in the back: it is good to be opened for the purging of melancholy' (spelling modernised).